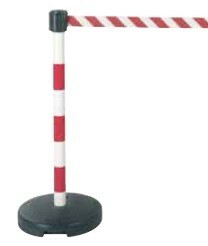 PVC post with 50 mm belt head. 3 red / white -. Fillable base 9 kg. Home / PVC post with 50 mm belt head. 3 red / white -. Fillable base 9 kg. 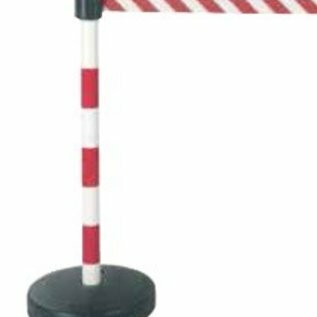 PVC post on a fillable base that can be weighted with sand or gravel to 9 kg. Belt head with red and white ribbon, length of 3 meters x 50 mm. Ø 50 mm on base in PE. Pedestal Ø 360 mm x 70 mm. Fillable to max. 9 kg. Belt head adjustable in different directions. Head in black ABS, anti-UV treated. Base can be weighted with sand or gravel to 9 kg.